I was making a fruit salad for my kids this past weekend, but it has been so cold here that I really started craving a hot drink. 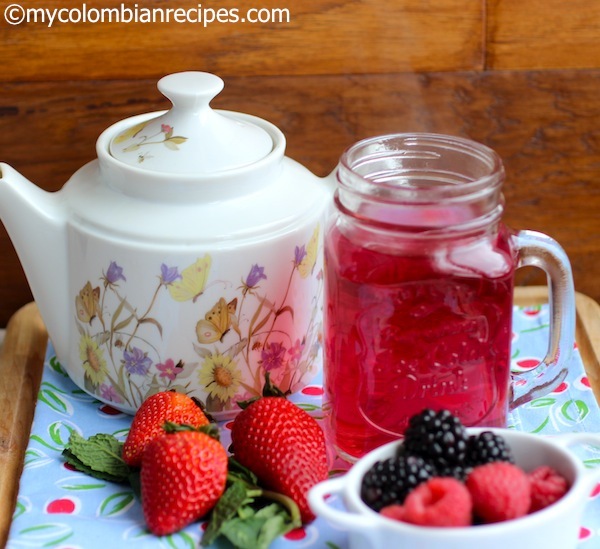 So I decided to use some of my berries to make this Colombian drink. 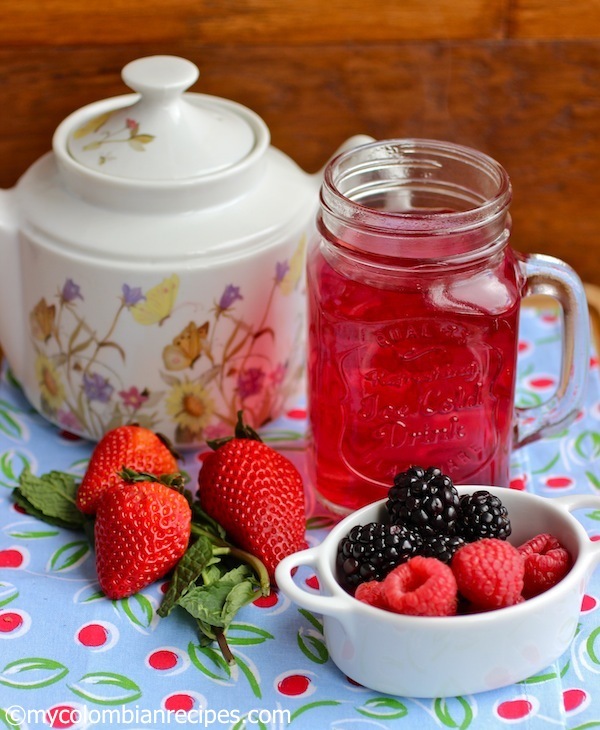 I am not a huge tea person, but I absolutely love this fresh fruit tea recipe. The first time I had this Aromática de Frutas was a couple of years ago at my friend’s house, who is from Bogotá, Colombia, and I immediately fell in love with it. I heard about this drink while I was living in Colombia many years ago, but never tried it because I always preferred a cup of coffee over a cup of tea. 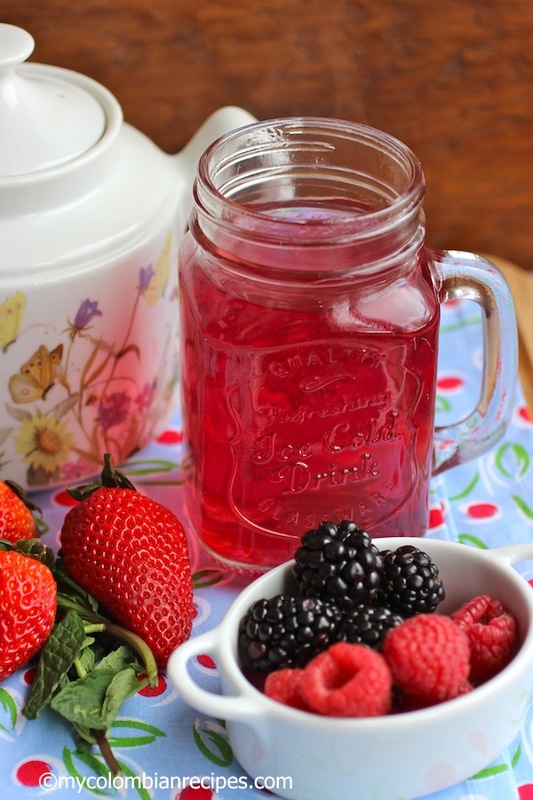 This fruit tea is very popular in the Andean zone of the country and it’s beyond simple. 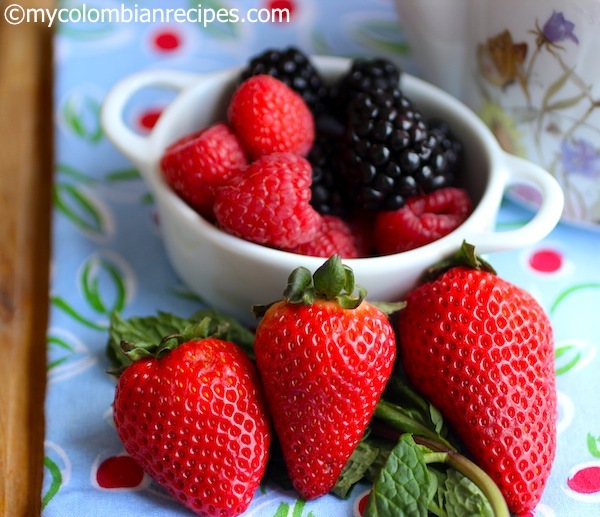 You simmer down sugar and water to make a light syrup then add the berries and let it sit to give the flavors time to develop. You can brew this as weak or strong as you like. I like my Aromática de Frutas sweet, but if you don’t like sugar in your tea, just omit it or add honey instead. I also like mine chilled, which is great on a hot summer day. Bring three cups of water to a simmer. While the water is heating, pound the mint to break it up a bit. I use a mortar and pestle, but you can use a wooden spoon. 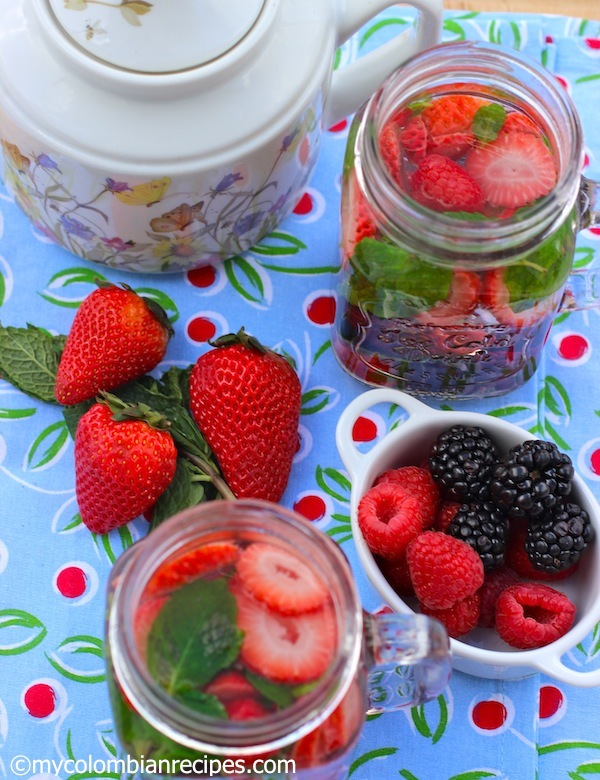 When the water is hot, stir in the fruits and the mint. Simmer for 3-5 minutes, remove from the heat, cover, and allow to sit for another 3 minutes. Strain the tea into a pot or container. Looks deliicous! 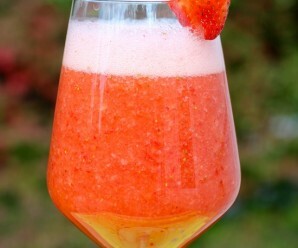 When the warm weather finally arrives this oculd be served cold too! Hang in there it is almost spring. 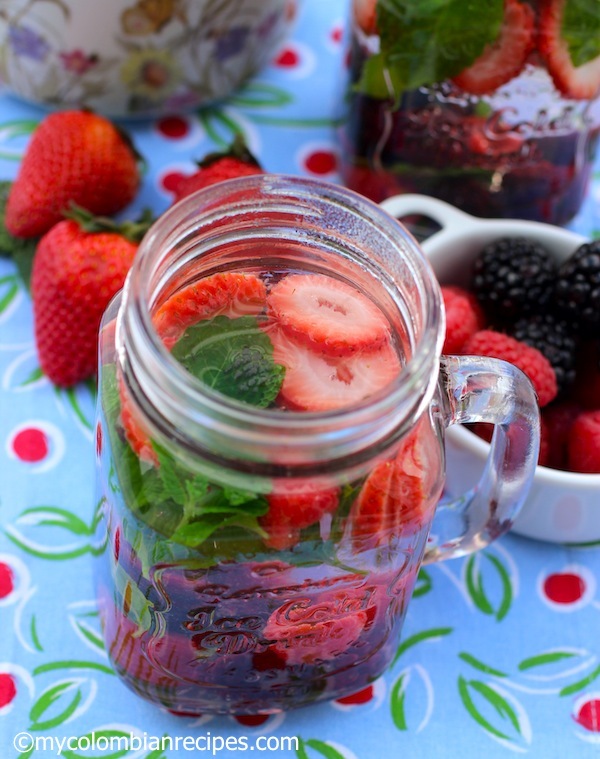 This looks refreshing. 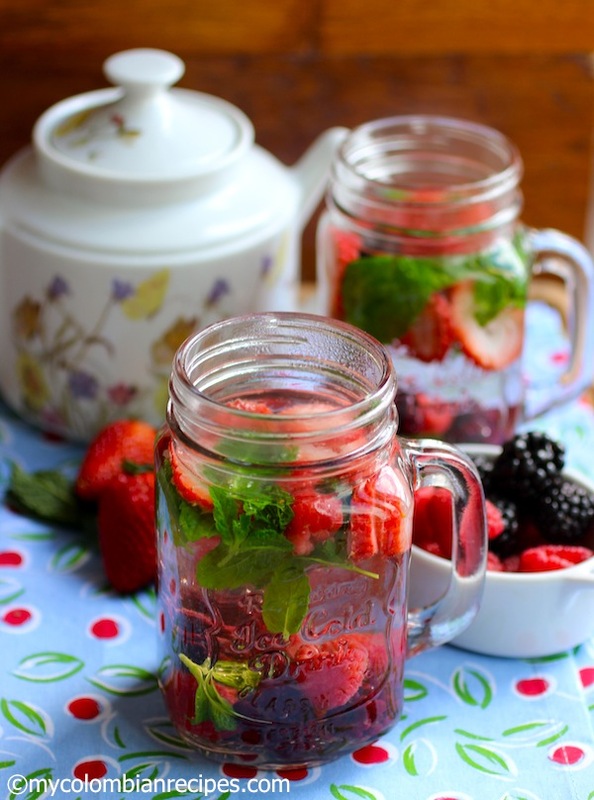 Tea is becoming a fashionable marinade or brine ingredient last year and this year. I wonder how this tea would be with it’s fruity flavors. I forget I read that you don’t really care for tea. I am teasing here. Naturally I was curious about the fruit tea. I like it! It’s ‘real’ fruit juice. Very refreshing and such a gorgeous color. This is the second time I have been on your site and I am truly enjoying it. Thank you for taking the time to share your expertise. Tiene que ser delicioso! Lastima de que aquí no se acostumbra usar o mejor dicho no es común encontrar los blackberries y raspberries. 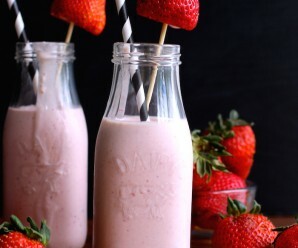 Las fresas si tenemos 🙂 Gracias por compartir, es algo que me encantaría probar. Do u have to use mint? ?? ?